Posted January 19th, 2017 by Al Broberg & filed under Blog. A number of years ago, the DeBeers Corporation saw its influence over the supply of rough diamonds into the retail pipeline decrease as more players entered the field independent of their marketing network. They correctly saw this as a permanent change and responded by going downstream, opening their own retail outlets and “branding” their finished jewelry as Forevermark. This echoed their “Diamonds are Forever” advertising campaign of earlier decades. Now, they have introduced a new Black Label Collection of diamonds that they say is the “best representation of the most beautiful of our diamonds. These diamonds, they say, are for light lovers only. Well, who isn’t a light lover when it comes to diamonds? That is what we find beautiful about diamonds, the optical effects: the brilliant return of light to the eye, the dancing of light that we call scintillation and the flashes of color that is caused by the separation of white light into the spectral colors. 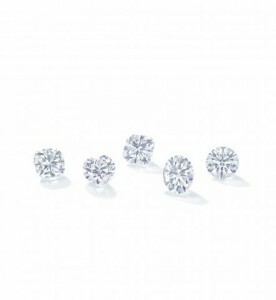 The Black Label Collection, says DeBeers, does this to a degree not seen before, especially with fancy shaped diamonds. The Black label Collection, they say, are the world’s most beautiful and symmetrical diamonds. Great emphasis is put on the symmetry of the cut. In creating this collection, DeBeers along with HRA Group spent 10 years developing perfectly symmetrical fancy shaped diamonds. The perfect symmetry extends beyond the bellies and shoulders to the facets themselves and is said to account for the brighter, more sparking fancy shaped diamond that was their goal. The Black Label Collection is intended to appeal to Millenials to give them something different. DeBeers named the arrow pattern seen under magnification in a perfectly symmetrical diamond the “Compass of Light” in an attempt to signify to Millennials that this is a diamond cut to a degree of perfection beyond ideal. The ideal cut is a range of parameters that makes for a beautiful stone, but the Black Label is an even narrower range of parameters. I would suggest that you should expect to pay more.